The group continued to accept the concepts of history painting and mimesis, imitation of nature, as central to the purpose of art. The Pre-Raphaelites defined themselves as a reform movement, created a distinct name for their form of art, and published a periodical, The Germ, to promote their ideas. The group's debates were recorded in the Pre-Raphaelite Journal. As an aspiring poet, Rossetti wished to develop the links between Romantic poetry and art. By autumn, four more members, painters James Collinson and Frederic George Stephens, Rossetti's brother, poet and critic William Michael Rossetti, and sculptor Thomas Woolner, had joined to form a seven-member-strong brotherhood. Ford Madox Brown was invited to join, but the more senior artist remained independent but supported the group throughout the PRB period of Pre-Raphaelitism and contributed to The Germ. Other young painters and sculptors became close associates, including Charles Allston Collins, and Alexander Munro. The PRB intended to keep the existence of the brotherhood secret from members of the Royal Academy. In 1848, Rossetti and Hunt made a list of "Immortals", artistic heroes whom they admired, especially from literature, some of whose work would form subjects for PRB paintings, notably including Keats and Tennyson. In 1850, the Pre-Raphaelite Brotherhood became the subject of controversy after the exhibition of Millais' painting Christ in the House of His Parents was considered to be blasphemous by many reviewers, notably Charles Dickens. Dickens considered Millais' Mary to be ugly. Millais had used his sister-in-law, Mary Hodgkinson, as the model for Mary in his painting. The brotherhood's medievalism was attacked as backward-looking and its extreme devotion to detail was condemned as ugly and jarring to the eye. According to Dickens, Millais made the Holy Family look like alcoholics and slum-dwellers, adopting contorted and absurd "medieval" poses. The brotherhood found support from the critic John Ruskin, who praised its devotion to nature and rejection of conventional methods of composition. The Pre-Raphaelites were influenced by Ruskin's theories. He wrote to The Times defending their work and subsequently met them. Initially, he favoured Millais, who travelled to Scotland in the summer of 1853 with Ruskin and Ruskin's wife, Euphemia Chalmers Ruskin, née Gray (now best known as Effie Gray). The main object of the journey was to paint Ruskin's portrait. Effie became increasingly attached to Millais, creating a crisis. In subsequent annulment proceedings, Ruskin himself made a statement to his lawyer to the effect that his marriage had been unconsummated. The marriage was annulled on grounds of non-consummation, leaving Effie free to marry Millais, but causing a public scandal. Millais began to move away from the Pre-Raphaelite style after his marriage, and Ruskin ultimately attacked his later works. Ruskin continued to support Hunt and Rossetti and provided funds to encourage the art of Rossetti's wife Elizabeth Siddall. Artists influenced by the brotherhood include John Brett, Philip Calderon, Arthur Hughes, Gustave Moreau, Evelyn De Morgan, Frederic Sandys (who entered the Pre-Raphaelite circle in 1857) and John William Waterhouse. Ford Madox Brown, who was associated with them from the beginning, is often seen as most closely adopting the Pre-Raphaelite principles. One follower who developed his own distinct style was Aubrey Beardsley, who was pre-eminently influenced by Burne-Jones. Pre-Raphaelitism had a significant impact in Scotland and on Scottish artists. The figure in Scottish art most associated with the Pre-Raphaelites was the Aberdeen-born William Dyce (1806–64). Dyce befriended the young Pre-Raphaelites in London and introduced their work to Ruskin. His later work was Pre-Raphaelite in its spirituality, as can be seen in his The Man of Sorrows and David in the Wilderness (both 1860), which contain a Pre-Raphaelite attention to detail. Joseph Noel Paton (1821-1901) studied at the Royal Academy schools in London, where he became a friend of Millais and he subsequently followed him into Pre-Raphaelitism, producing pictures that stressed detail and melodrama such as The Bludie Tryst (1855). His later paintings, like those of Millais, have been criticised for descending into popular sentimentality. Also influenced by Millais was James Archer (1823-1904) and whose work includes Summertime, Gloucestershire (1860) and who from 1861 began a series of Arthurian-based paintings including La Morte d'Arthur and Sir Lancelot and Queen Guinevere. Pre-Raphaelism also inspired painters like Lawrence Alma-Tadema. Birmingham Museum & Art Gallery has a world-renowned collection of works by Burne-Jones and the Pre-Raphaelites that, some claim, strongly influenced the young J. R. R. Tolkien, who wrote The Hobbit and The Lord of the Rings, with influences taken from the same mythological scenes portrayed by the Pre-Raphaelites. Tolkien considered his own group of school friends and artistic associates, the so-called TCBS, as a group in the vein of the Pre-Raphaelites. In the 20th century artistic ideals changed, and art moved away from representing reality. Since the Pre-Raphaelites were fixed on portraying things with near-photographic precision, though with a distinctive attention to detailed surface-patterns, their work was devalued by many painters and critics. After the First World War, British Modernists associated Pre-Raphaelite art with the repressive and backward times in which they grew up. In the 1960s there was a major revival of Pre-Raphaelitism. Exhibitions and catalogues of works, culminating in a 1984 exhibition in London's Tate Gallery, re-established a canon of Pre-Raphaelite work. Among many other exhibitions, there was another large show at Tate Britain in 2012–13. Many members of the ‘inner’ Pre-Raphaelite circle (Dante Gabriel Rossetti, John Everett Millais, William Holman Hunt, Ford Madox Brown, Edward Burne-Jones) and ‘outer’ circle (Frederick Sandys, Arthur Hughes, Simeon Solomon, Henry Hugh Armstead, Joseph Noel Paton, Frederic Shields, Matthew James Lawless) were working concurrently in painting, illustration, and sometimes poetry. Victorian morality judged literature as superior to painting, because of its “noble grounds for noble emotion.” Robert Buchanan (a writer and opponent of the Pre-Raphaelite Brotherhood) felt so strongly about this artistic hierarchy that he wrote: “The truth is that literature, and more particularly poetry, is in a very bad way when one art gets hold of another, and imposes upon it its conditions and limitations." This was the hostile environment in which Pre-Raphaelites were defiantly working in various media. The Pre-Raphaelites attempted to revitalize subject painting, which had been dismissed as artificial. Their belief that each picture should tell a story was an important step for the unification of painting and literature (eventually deemed the Sister Arts), or at least a break in the rigid hierarchy promoted by writers like Robert Buchanan. The Pre-Raphaelite desire for more extensive affiliation between painting and literature also manifested in illustration. Illustration is a more direct unification of these media and, like subject painting, can assert a narrative of its own. For the Pre-Raphaelites, and Dante Gabriel Rossetti specifically, there was anxiety about the constraints of illustration. In 1855, Rossetti wrote to William Allingham about the independence of illustration: “I have not begun even designing for them yet, but fancy I shall try the ‘Vision of Sin’ and ‘Palace of Art’ etc. – those where one can allegorize on one’s own hook, without killing for oneself and everyone a distinct idea of the poet’s." This passage makes apparent Rossetti’s desire to not just support the poet’s narrative, but to create an allegorical illustration that functions separately from the text as well. In this respect, Pre-Raphaelite illustrations go beyond depicting an episode from a poem, but rather function like subject paintings within a text. There are major collections of Pre-Raphaelite work in United Kingdom museums such as the Birmingham Museum and Art Gallery, the Tate Gallery, Victoria and Albert Museum, Manchester Art Gallery, Lady Lever Art Gallery, and Liverpool's Walker Art Gallery. The Art Gallery of South Australia and the Delaware Art Museum in the US have the most significant collections of Pre-Raphaelite art outside the UK. The Museo de Arte de Ponce in Puerto Rico also has a notable collection of Pre-Raphaelite works, including Sir Edward Burne-Jones' The Last Sleep of Arthur in Avalon, Frederic Lord Leighton's Flaming June, and works by William Holman Hunt, John Everett Millais, Dante Gabriel Rossetti, and Frederic Sandys. There is a set of Pre-Raphaelite murals in the Old Library at the Oxford Union, depicting scenes from the Arthurian legends, painted between 1857 and 1859 by a team of Dante Gabriel Rossetti, William Morris, and Edward Burne-Jones. The National Trust houses at Wightwick Manor, Wolverhampton, and at Wallington Hall, Northumberland, both have significant and representative collections. Andrew Lloyd Webber is an avid collector of Pre-Raphaelite works, and a selection of 300 items from his collection were shown at an exhibition at the Royal Academy in London in 2003. Kelmscott Manor, the country home of William Morris from 1871 until his death in 1896, is owned by the Society of Antiquaries of London and is open to the public. The Manor is featured in Morris' work News from Nowhere. It also appears in the background of Water Willow, a portrait of his wife, Jane Morris, painted by Dante Gabriel Rossetti in 1871. There are exhibitions connected with Morris and Rossetti’s early experiments with photography. The story of the brotherhood, from its controversial first exhibition to being embraced by the art establishment, has been depicted in two BBC television series. The first, The Love School, was broadcast in 1975; the second is the 2009 BBC television drama serial Desperate Romantics by Peter Bowker. Although much of the latter's material is derived from Franny Moyle's factual book Desperate Romantics: The Private Lives of the Pre-Raphaelites, the series occasionally departs from established facts in favour of dramatic licence and is prefaced by the disclaimer: "In the mid-19th century, a group of young men challenged the art establishment of the day. The pre-Raphaelite Brotherhood were inspired by the real world around them, yet took imaginative licence in their art. This story, based on their lives and loves, follows in that inventive spirit." Ken Russell's television film Dante's Inferno (1967) contains brief scenes on some of the leading Pre-Raphaelites but mainly concentrates on the life of Rossetti, played by Oliver Reed. ^ Landow, George P. "Pre-Raphaelites: An Introduction". The Victorian Web. Retrieved 15 June 2014. ^ McGann, Jerome J. The Complete Writings and Pictures of Dante Gabriel Rossetti, NINES consortium, Creative Commons License; http://www.rossettiarchive.org/docs/s40.rap.html retrieved 16 December 2012. ^ "Pre-Raphaelite Brotherhood 1848 - 1855 - HiSoUR Art Culture Exhibition". HiSoUR Art Culture Exhibition. 22 February 2017. Retrieved 27 December 2017. ^ Fowle, Frances (2000). "Sir John Everett Millais, Bt, Christ in the House of His Parents ('The Carpenter's Shop'), 1849-50". Tate. Retrieved 28 January 2019. ^ "Pre-Raphaelites: An Introduction". www.victorianweb.org. Retrieved 28 January 2019. ^ Lutyens, Mary. (1967). Millais and the Ruskins. London: John Murray. p. 191. ISBN 0719517001. ^ Clarke, Michael (2010). The concise Oxford dictionary of art terms - Pre-Raphaelite Brotherhood. Oxford: Oxford University Press. ISBN 9780199569922. ^ Whiteley, Jon (1989). Oxford and the Pre-Raphaelites. Oxford: Ashmolean Museum. ISBN 0907849946. ^ "Fine Art Books Art Instruction | Photography Books | Visual Arts Periods, Groups & Movements: Pre-Raphaelites". fineartbookstore.com. Retrieved 27 December 2017. ^ Goldman, Paul (2004). Victorian Illustration: The Pre-Raphaelites, the Idyllic School and the High Victorians. Burlington, VT: Lund Humphries. pp. 1–51. ^ Welland, Dennis S. R. (1953). 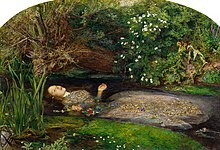 The Pre-Raphaelites in Literature and Art. London, UK: George G. Harrap & Co. Ltd. p. 14. ^ Buchanan, Robert W. (October 1871). "The Fleshly School of Poetry: Mr. D.G. Rossetti". The Contemporary Review. as cited in Welland, D.S.R. The Pre-Raphaelites in Literature and Art. London, UK: George G. Harrap & Co. Ltd., 14. ^ "Chapter One: Ruskin's Theories of the Sister Arts — Ut Pictura Poesis". www.victorianweb.org. Retrieved 21 November 2017. ^ a b c Rossetti, Dante Gabriel (1855). Letter from D.G. Rossetti to William Allingham. The Pre-Raphaelites in Literature and Art. ^ Desperate Romantics press pack: introduction BBC Press Office. Retrieved on 24 July 2009. ^ Armstrong, Stephen (5 July 2009). "BBC2 drama on icons among Pre-Raphaelites". The Sunday Times. Retrieved 25 July 2009. Barringer, Tim (1998). Reading the Pre-Raphaelites. New Haven, Conn.: Yale University Press. ISBN 0-300-07787-4. Gaunt, William (1975). The Pre-Raphaelite Tragedy (rev. ed.). London: Cape. ISBN 0-224-01106-5. Hawksley, Lucinda (1999). Essential Pre-Raphaelites. Bath: Dempsey Parr. ISBN 1-84084-524-4. Prettejohn, Elizabeth (2000). The Art of the Pre-Raphaelites. Princeton, N.J.: Princeton University Press. ISBN 0-691-07057-1. Wikimedia Commons has media related to Pre-Raphaelite paintings. Wikisource has the text of The New Student's Reference Work article "Pre-Raphaelitism".